Our determination to trailblaze the CRM Software movement for Real Estate Builders in India drives us every day to design and develop cutting edge CRM Technology. With implementation in over 200+ projects and processing tens of thousands of units for builders across India from Jammu to Mysuru and from Alibag to Kolkata, it is just the beginning for DaeBuild real estate crm. We bring on to you a centralized platform to capture and process all your leads from voice, property portals, corporate website with the concept to never miss a lead and never miss a follow up. Our post booking processes like Auto Invoicing/Demands, 3 Tier Payment Reminders and Customer Interactions automates your core workflow so that you can focus more on engaging with your customers. We are continuously striving to bring in more and more Pre and Post Sales Automation in Real Estate so that you can keep your focus on engaging with your customers and building long lasting relations. In this growing age of technology, Real Estate developers needs to keep up pace to serve its customer better, and with DaeBuild CRM comes trust and transparency that bridges the gap between builders and their customers. Its depth of features ranging from Inquiry Life Cycle Management, Customer Interactions, Bookings and Accounts, makes it unique and a must-have tool in the pocket of every builder to keep a tab on the entire life cycle of sales and customer management. 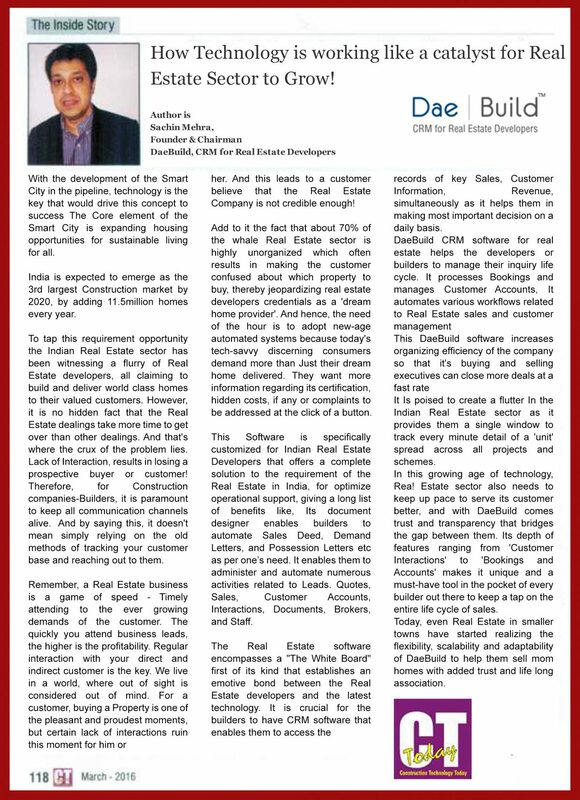 DaeBuild CRM is preferred Real Estate CRM software for various Builders and Developers, spread across numerous cities of India. Our customers include Developers in the space of Townships, Mixed Use Projects, Residential, Commercial and Plotting. I wanted to thank you for all your help and dedication with my CRM, you are always willing to help and that is a major credit to you and your company. We feel good to say that DaeBuild, CRM Software for Real Estate has out performed our expectations & we never expected it to be so flexible and user-friendly. We are still exploring its vast functionality. Ganesh Housing – Top Real Estate Builder of Ahmedabad implements DaeBuild CRM. Thank you Ganesh Housing for choosing DaeBuild as your CRM Platform. DaeBuild CRM installation base expands to Jammu. 8 Boundaries Builders Pvt. Ltd is engaging with their customers using DaeBuild CRM. DaeBuild Real Estate CRM is now GST Ready. Design RERA approved documents using Document Manager. APS Group’ Chandigarh implements DaeBuild for Pre and Post Sales management. LEPL Projects’ Vijayawada implements DaeBuild for “The Residences at Mid Valley City” project located in Vijayawada Guntur Highway. Metro Builders’ Odisha’s fastest growing company in real estate segment implements DaeBuild. Elysium Group’ Thailand implements DaeBuild for its Residential project in Pattaya. The Hermitage Park’ Zirakpur trusts DaeBuild for its mission to ensure absolute customer satisfaction. DaeBuild is a preferred choice of GOYAL & Co, one of the largest Real Estate developers in Ahmedabad. DaeBuild automates customer and sales management processes for “The Pyramid” project by LGW Limited in Rajarhat’ Kolkata.